I know you're all super maTuuure. And by that I mean all grown up and shite. You sit around all day sipping Prosecco, talking about stocks and bonds and referencing recent articles in Atlantic Monthly, doncha? On the other hand, maybe you're sipping Cherry Coke Zero, talking about the closest Coin Star location for converting your loose change into cash and referencing last night's episode of Project Runway. Or hopefully there's something in between. Either way, I am going to go out on a limb and confess my love of Lip Smacker chapsticks. Still, it's hard not to feel a little silly as an adult applying cotton candy and Dr. Pepper-scented lip stuff. 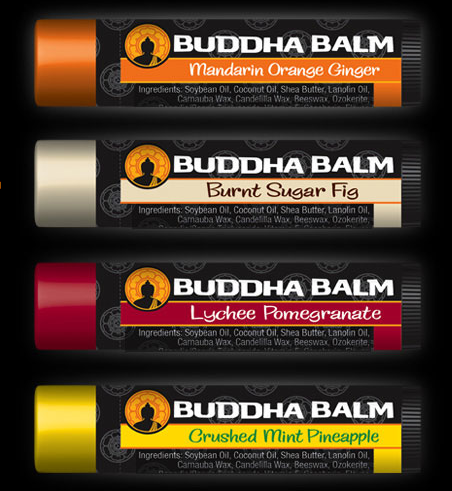 Enter Buddha Balm: Basically, this is organic chapstick for grown ups. Gotta love! I'm especially loving the Mandarin Orange Ginger. Bring. It. On. Can't you just feel my maturity? Do you see my smoking jacket and pipe, Dahling?